Just 925,000 people watched the first airing of Sunday's Miss USA pageant on Reelz, according to Nielsen, down 83 percent from the 5.56 million who watched it on NBC last year. Reelz, which is available in 70 million homes, says the pageant and its rebroadcasts, including VOD viewing, add up to 2.5 million total viewers. "The value we bring as an independent network produced an extraordinary night of television that America tuned in to watch," said Reelz CEO Stan E. Hubbard. Reelz acquired the rights to the TV broadcast just 10 days before Sunday's pageant. Univision and NBC pulled it from the airwaves in June after cutting business ties with pageant co-owner Donald Trump over Trump's comments on immigration. Though viewership didn't crack 1 million, it was still a hit for Reelz. The last time the cable network drew an audience that large was 2011, when it aired the controversial miniseries The Kennedys, which averaged slightly more than 1 million first-run viewers over six nights. The pageant was a hit on Twitter. According to Nielsen Twitter TV rankings, 70,000 tweets were seen by 2.42 million people. NBC, which has been airing Miss USA since 2003, hit 13 million viewers for the 2004 pageant, its most ever. The most-watched Miss USA on record was the 1979 contest, which drew 38 million viewers on CBS. 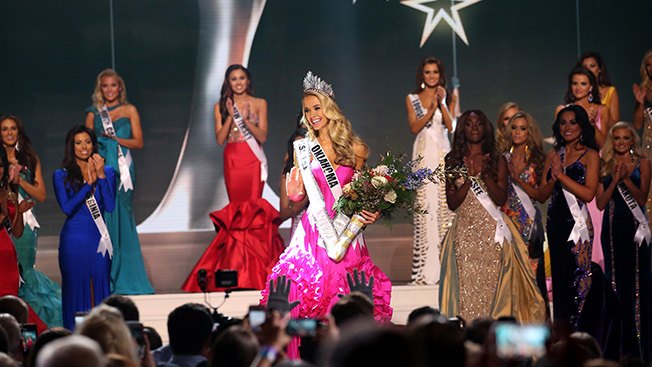 Olivia Jordan, Miss Oklahoma, was crowned Miss USA 2015.